Regular delivery hours are Monday through Saturday, 8:00 am to 5:00 pm. We schedule our deliveries by geographic location and contact our customers to arrange a date convenient for their schedule. 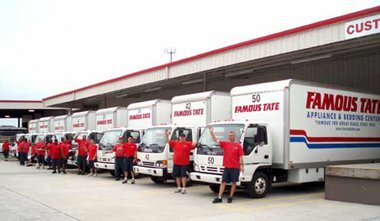 We provide a 2-hour time window for deliveries and will accommodate you as much as possible. If your merchandise is IN STOCK, you will be contacted to arrange delivery - or, if you are difficult to reach, we request you call us for delivery arrangements. Our delivery professionals will have the proper tools and be happy to assemble and place your new products as long as space has been cleared ahead of delivery. For more information, contact any of our associates or use the widget below.